At the last GSS Council meeting on July 23, 2009, a plan to expand Koerner’s Pub came up for council approval. However, before it could be dealt with quorum was lost for the third month in a row and no decision could be made. This project has been on the table for quite a while now, and many people have put a lot of work into refining the design and financing options of the plan. Most graduate students and other patrons of Koerner’s Pub are unaware of the planned pub expansion. Since it represents one of the biggest and most meaningful projects the GSS has considered in a number of years, this post is meant to inform all of those people about what the project’s all about, why it’s worthwhile, and what the current situation is. Most of the information in here represent the findings of the Pub Patio Project Task Force (PPPTF) and its presentation to council, which can be viewed here. The following is a guest post by Dan Beaton, a PhD student in Physics and GSS Councilor. In 2004, GSS council created a task force to look into the possibility of turning Koerner’s into a brewpub, an idea which came from the manager at the time. Although we do try, grad students (and other Koerner’s patrons) don’t drink enough beer to make having our own brewpub feasible. If this plan was ever to work, it would be necessary to get more customers into the pub. Two options were proposed to increase traffic: food service and expansion. The taskforce at the time recommended both, with no recommendation as to which should happen first. About a year and a half later, the current manager, Rick Carre, was hired and a GSS survey indicated that students felt Koerner’s could be improved by providing food service. Rick made it happen and as a result Koerner’s is now much busier, especially at meal times. What happened next was some discussion within the GSS about two capital projects: expanding Koerner’s pub and renovating the ballroom and the latter was ultimately chosen. At the same time, another group of councilors looking into the society’s mandate concluded that Koerner’s needs to be expanded in order to continue to meet graduate student expectations since the grad population had increased from 6,000 to 9,000 students. Last year the society felt that the project was sufficiently important to spend several thousand dollars on designs and plans – not to mention countless hours of the manager’s time. 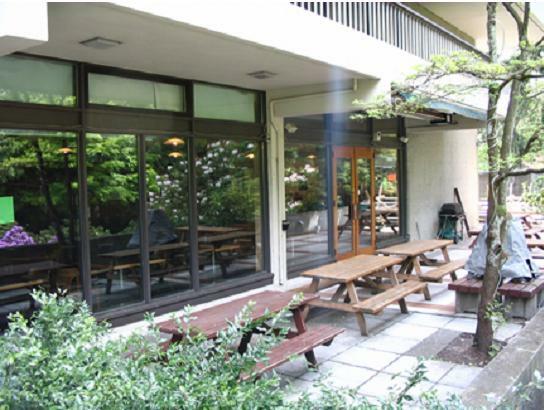 The basic idea is that some outdoor patio space currently containing a few picnic tables would be get a pre-fab, glassed-in enclosure to make space that would be useable all year round. (See pictures) Since this is not actually new space, it is already included in the existing liquor licence. 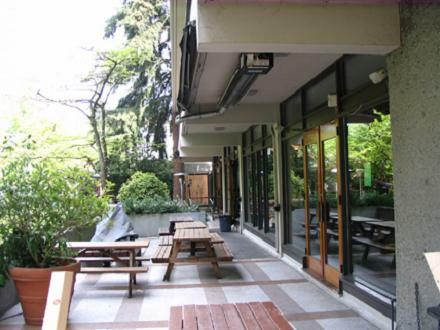 Sitting outside at Koerner’s in the summer is one of, if not the best pub experience at UBC (it was voted one of the best patios in Vancouver by the Georgia Straight). Although this would eliminate some outside patio space, there would still be lots of outdoor space available. Even though we are currently in the middle of the hottest Vancouver temperatures ever, remember that most of the year has miserable weather. Space needs to be enclosed if it is to be useful for more than 3-4 months of the year. Two views of the area that would be enclosed by the new patio. 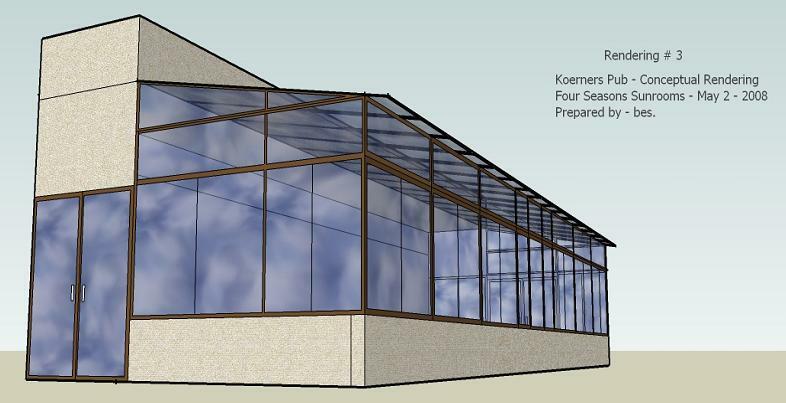 Conceptual Rendering of glassed-in patio. The project was actually ready to go last November but delays have pushed the cost of the project up more than $20K. The current quote is/was good until the end of July. The contractor is so keen to see the project go ahead they are willing to provide a $41,000 interest free loan to be paid off over two years. Of course the underlying assumption with this project is that it would eventually pay for itself through increased revenues. Based on projections, it could add an extra $180,000 of revenue each year, resulting in an extra $50,000 in profit. The assumptions made to arrive at this figure are that with the patio, Koerner’s will get 25 more people (in the added 40 seats) for 2 hours during lunch time and 2 hours during dinner time for each of Monday, Thursday and Friday spending $10/hour. In other words and extra $125 spent in Koerner’s per hour to 40 seats; or even simpler $3.15/seat/hour for meal times three days a week. If you’ve ever been to Koerner’s on a Monday or Friday night, you know how busy it can get – this is not included in the estimate (neither are other days of the week) and therefore I think, and many agree, that the numbers are quite conservative. The costs associated with providing the product these seats is 46% of the revenue and the cost of servicing these seats (2 extra staff and some other expenses) is 47% of the remainder. So of the revenue collected, 71% goes to cover costs; the rest would go either into paying down the cost of the expansion, or to profits. That’s where the extra $50,000 comes from. The payback period was also examined, and is simply the total cost of the project divided by the annual added income. Five years was identified as a suitable payback period, and the project should fall within this criterion. A best case scenario would see the patio paid off in 3.3 years and an absolute worst case scenario gave a payback period of 13 years. The GSS is capable of paying for the whole project itself. Each year every graduate student pays a $5 fee for capital improvements (CPIF). Between the surplus from 2008 and the 2009 funds, there is $65,000 in CPIF funds available. General revenues for the GSS also had a surplus in 2008, from which up to $40,000 is available. That could cover the upfront $98,000 payment to the contractor. The two-year $41,000 interest-free loan from the contractor could be paid off from extra pub revenues once the new patio is up and running. This leaves the GSS still short $35,000 on the project, but that could be paid for with a loan, more of the 2008 surplus (which was $69,000 in total), outside funding, or sponsorships. This project may result in some short term cash flow problems, but all of the GSS’s programs and services should remain unaffected. The GSS makes annual budget including all the annual projects, parties, events, etc the GSS puts on which would remain intact. While council did have the opportunity to discuss the issue at the last meeting, the discussion got severely side-tracked by a lengthy Economics 101 lecture necessitated by a very few people at the meeting who either did not understand, or were presenting confusing information to council. These people were former and current executives. Although the GSS executives are against the project, council is ultimately the body to make this decision, a decision that will have to be made at some point. Too much work has gone into this plan from too many people for it to fail due to continued lack of quorum.